Wolf in Exile is Amber Ella Monroe’s contribution to 21 SHADES OF NIGHT box set. 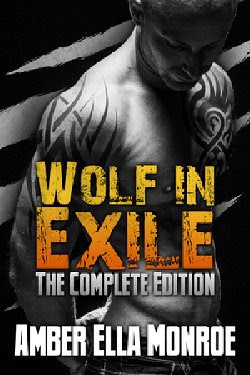 Wolf Shifter Thane Silex was sentenced to exile by the United Council of Nightdwellers for his suspected involvement in a crime. If he doesn’t clear his name, Thane is bound to spend the rest of his days in captivity. His thirst for vengeance escalates and his vendetta against his traitorous brother consumes him. Without the camaraderie of a Pack and the absence of supporters, a wolf begins to lose hope. Thane is headed down a hopeless path, until one night a strong-willed woman enters his world and his desire to endure returns. After Kalena stumbles upon a murder scene, she’s kidnapped and thrown inside of a barricade filled with bloodthirsty wolves. Her savior comes in the form of a centuries old wolf named Thane. If she wants to survive and escape exile, she’ll have to trust him. But soon she discovers that she’s also falling for him, and one split second decision will irrevocably tie her to his world. While these two are learning to love each other, future revelations and hurdles will threaten to tear them apart. Amber Ella Monroe loves weaving tales where undying love is the main element. When she’s not writing, she’s plotting. When she’s not writing or plotting, she’s reading. She’s a thirty-something year old wife, mother, book hoarder, 90s music fan, earl grey tea drinker, dark roast coffee fiend, platform and stiletto shoe collector, Keurig lover, and martial arts/action movie fanatic. She also writes contemporary romance as USA Today Bestselling author Ambrielle Kirk. 21 Steamy Paranormal & UF Romances from today’s hottest NY Times, USA Today, & International Bestselling authors. Secure your pre-order price of #99c. 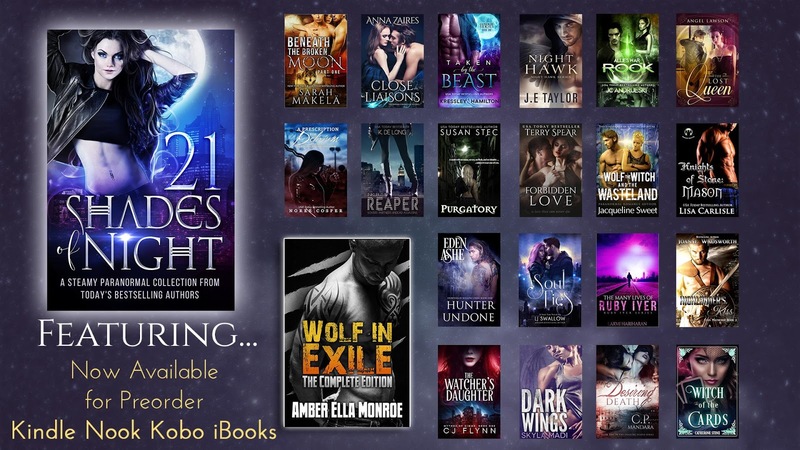 21 Shades of Night is already an Amazon Bestseller. Grab this collection today before it’s gone for good! With one million words of romantic paranormal fiction, this boxed set will light up your night with vampires, witches, warriors, and more! This limited edition omnibus is packed with today’s NY Times, USA Today, and International Bestselling authors to create a collection you won’t soon forget. With 100 hours of reading, you’re paying a penny per sixty minutes of enjoyment. Grab this collection today before it’s gone for good! Save over $50! This set is only available at this price for a limited time, so order your copy before it’s gone!